There’s no better way to start a Friday morning than with coffee, mimosas, and a talk by some of DC’s greatest creatives. Which is exactly what Homiera and I did last Friday, minus the mimosas. I’m working, remember? For the last two years WDG has sponsored CreativeMornings, a breakfast lecture series for the creative community. CreativeMornings has over 80 chapters all over the world, including DC. It’s a fantastic way for the creative community to gather around great food, get to know each other, and learn from stellar artists, graphic designers, activists, photographers, and even an astrophysicist or two. Last Friday’s talk was by Maggie O’Neill. Maggie is an artist and co-founder of SwatchRoom, a full-service design and fabrication company. A self-purported lover of color, Maggie’s talk can be simplified into three words: live in color. As an artist, she not only uses colors to guide her artistic direction, but her direction in life too. Like the people we surround ourselves with, color can affect us in indescribable ways. The key to living color–or music or dance–is to trust your gut and look for those spontaneous moments of brilliance. “It’s a fact, I have a [word here].” Want to know what I’m referring to? Check back to CreativeMornings DC to see when her talk is posted. This post wouldn’t be complete without mentioning the venue: Blind Whino. A church built in the 1900s, the structure was left vacant for some time until companies Art Whino and Suite Nation found it. 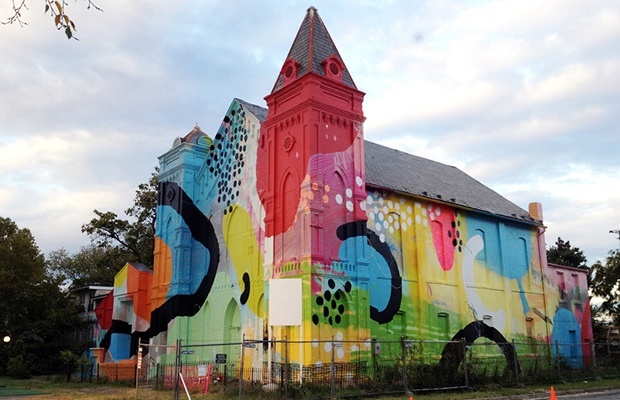 Joining forces, Blind Whino was then converted from a church into an art gallery, workshop, and performance hall. Now, it is a place where the creative community can converge and learn through artistry. As far as unfair stereotypes go, DC is not often recognized as a creative hub. Blind Whino is breaking that reputation. These talks are free and open to the public, just make sure to request a ticket before hand. You don’t have to be an artist by trade (I’m not) to appreciate the value of what these creatives have to say. I promise, it’ll be worth it.